SALEM, Ore. – A lottery ticket purchased in Medford turned out to be worth $150,000. 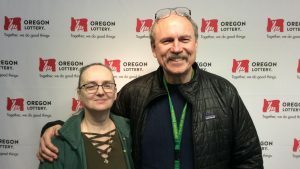 Michael Faught, a former public works director now living in Lebanon, bought some Powerball tickets at the Medford Food for Less. Faught said he and his wife were talking to a financial advisor and planned to use some of the money for home improvements and to “enhance” an already-planned trip to Disneyland.